The US Foundation for Defence of Democracies’ (FDD) department, the CSIF (Center on Sanctions and Illicit Finance) revealed that cryptocurrencies are not suited for financing terrorist groups. The department’s director of analysis Yaya Fanusie presented this report at the US House of Representatives Subcommittee on Terrorism and Illicit Finance hearing. Fanusie gave examples of how digital currencies did not work for such groups. The “first” funding campaign for terrorism called Jahezona was conducted in 2016. However, the entire fundraising was visible on the Blockchain, meaning it was possible to track the group. According to a new research done by GreySpark Partners, almost 50% of the Initial Coin Offerings (ICOs) conducted in 2017 and 2018 have failed to raise any funding. However, another 40% were able to raise about $1 million each. According to this research, as many as 890 ICOs were unable to raise any funds at all. On the other hand, another 40% of the ICO population was able to reach the $1 million fund raising target. GreySpark’s report also showed that many projects failed to provide any kind of positive ROI (Return on investment) over time. Find out the details of the story here. First Block Capital Inc., which claims to be Canada’s first and only Bitcoin fund that is regulated, has been given mutual fund trust status. This means that investors can put their fund units into self-directed registered accounts. First Block made an official announcement that their investors in its core product – the FBC Bitcoin Trust, which only accredited investors could buy – could also now invest in Registered Retirement Savings Plans (RRSPs) and even Tax-Free Savings Accounts (TSAs). This way investors can now put their money into accounts that will give them substantial tax savings. Read about the full story here. 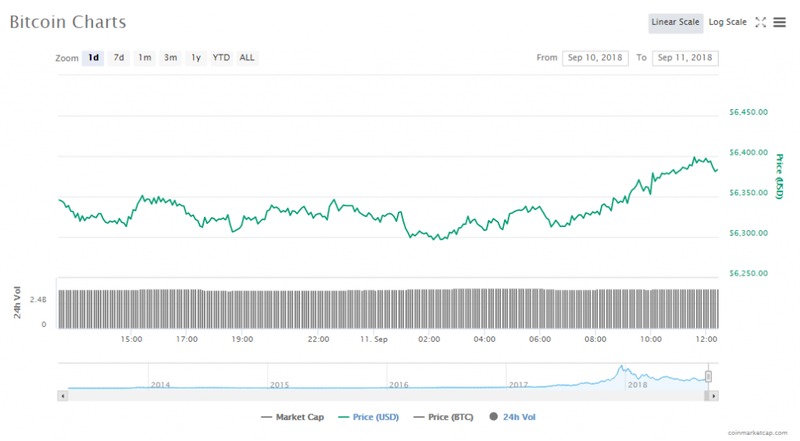 The cryptocurrency market’s trading volumes dropped by $0.35 billion to $10.94 billion since yesterday. Capitalization of all the cryptocurrencies as a whole is at $196.92 billion, a $0.9 billion increase in the last one day. Bitcoin’s current price is at $6383.21, a 0.70% gain from yesterday. The virtual currency’s market cap is $110.14 billion, with trade volumes staying the same at $3.73 billion. Ethereum’s current trading price is $196.59, a 0.92% drop since yesterday. The altcoin’s market cap is now at $20.06 billion and its trade volumes are at $1.49 billion. Most of the cryptocurrencies in the top ten list showed declines today after yesterday’s mild rally. Bitcoin and Monero are the only two cryptos in this list that have showed gains in trading so far today. The rest of the cryptos, however, have not fared as well. The hardest hit in trading so far today is Cardano, which has lost another 4.23% of its token price. Bitcoin’s trading price is currently $6383.21, gaining 0.70%. The crypto’s market cap is now at $109.79 billion. Ethereum’s trading price is currently $196.59%, falling 0.92%. The crypto’s market cap is now at $20.06 billion. Ripple’s trading price is currently $0.271540, falling 2.51%. The crypto’s market cap is now at $10.78 billion. Bitcoin Cash’s trading price is currently $473.76, falling 2.11%. The crypto’s market cap is now at $8.21 billion. EOS’s trading price is currently $5.06, climbing 0.29%. 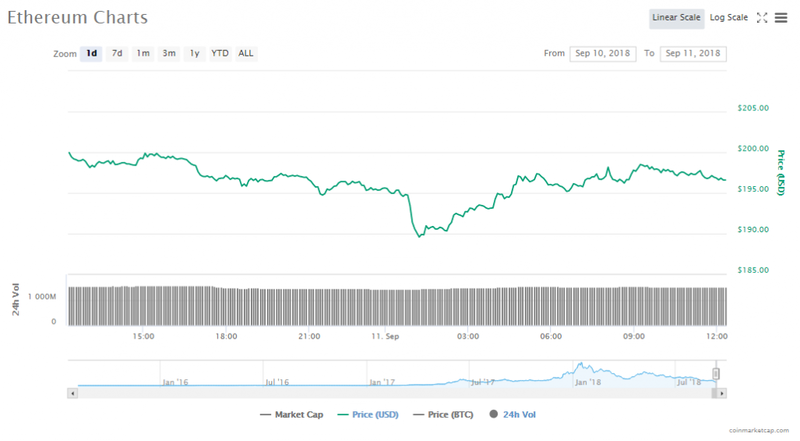 The crypto’s market cap is now at $4.58 billion. Stellar’s trading price is currently $0.193008, falling 0.22%. The crypto’s market cap is now at $3.62 billion. Litecoin’s trading price is currently $54.57, falling 1.74%. The crypto’s market cap is now at $3.17 billion. Tether’s trading price is currently $1, falling 0.05%. 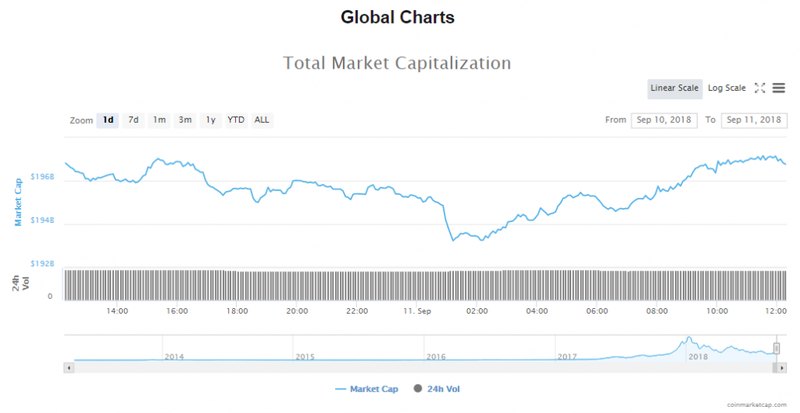 The crypto’s market cap is now at $2.76 billion. Cardano’s trading price is currently $0.073804, falling 4.23%. The crypto’s market cap is now at $1.95 billion. Monero’s trading price is currently $108.93, gaining 0.60%. The crypto’s market cap is now at $1.78 billion. Wopke Hoekstra, the Dutch Minister of Finance published a letter to the Parliament this week. In it, he proposed an international approach to the regulation of cryptocurrencies. The Irish Cabinet, the executive arm of the country’s government, has approved a bill that will put into effect the EU’s Fifth Anti-Money Laundering (AML) Directive. A technical glitch in a Tokyo-based cryptocurrency exchange which allowed users to buy Bitcoin for free. Zaif, an exchange registered with the government and run by Tech Bureau Corp, stated that an error occurred with the price calculation system, which caused the price of Bitcoin to be displayed as ¥0. A new subsidiary is being started by Dominion Capital in New York City that will offer loans against Bitcoin. The company has for a long time invested in multiple types of assets, however, its specialty has been to provide loan backing to financial projects.